Home | Random Stuff You Might Like | Need a last minute gift…get crafty! Need a last minute gift…get crafty! I am known within my family and circle of close friends as “the gift lady.” Every Christmas Eve, I have a Christmas party and the running joke is that EVERYONE gets a gift…even if you brought someone I wasn’t expecting. How do I achieve this? Well, I try to always have extra gifts on hand, just because there are folks that give you a gift that you weren’t expecting to and…well…tact and all that. But I rarely get caught off guard because I give absolutely EVERYONE a gift. Last year, BF offered its first Christmas Gift in a Jar selection…a festive bean soup jar! This year I decided to go a bit more indulgent with the diva’s teachers. I mean, after all, they do deal with my kids 6 hours a day for 118 days out of the year. I don’t think there is a gift enough to thank them for what they do! Hopefully they’ll use these jars for a few moments of sweet escape for themselves. This makes a great and thoughtful last-minute gift for anybody who has a sweet tooth and here’s the best part…it costs less than $5 to make each one! BUT (Disclaimer!) If sweets are your trigger: don’t do this one! 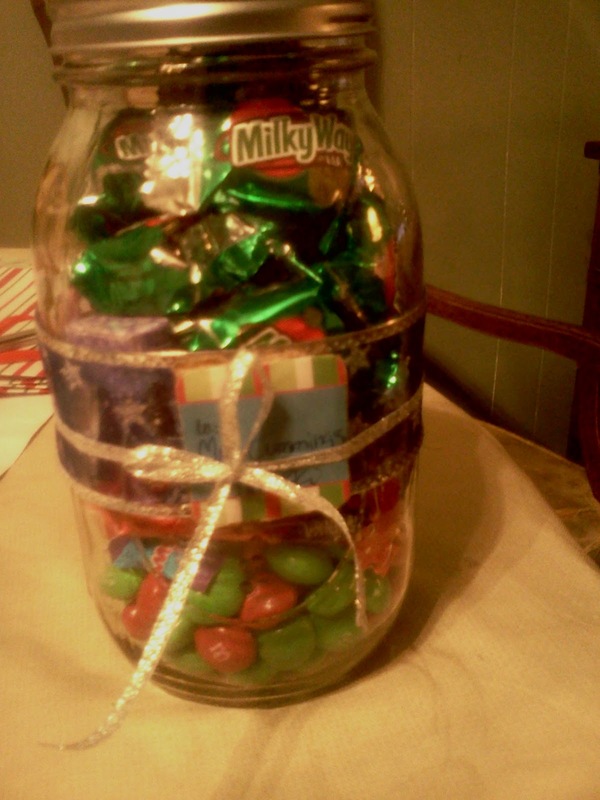 There are plenty of other gift in a jar ideas out there that can work for you! Check out the end of this post for a few of them. Open your jars and layer your candy in whatever way you see fit. I put the loose M&M’s at the bottom since they were going to end up there anyway! Put the top back on your jar. Measure out your wide ribbon so you have a piece that fits around your jar with just about 1/4 inch overhang. Place glue directly on the ribbon then affix it to the jar. Depending on the type of glue you use, you might need to work quickly. With “the Goop” I have a good 2-3 minutes adjusting time. Allow to dry. Affix gift tags to cardboard and then cut them out (oh yeah…might be a good idea to label the gift tag at this point too). Apply glue to the back of the cardboard and affix it to the front of the jar, directly on the ribbon. Tie the thinner ribbon around the jar and affix the bow right in the middle of the gift tag. This is a great project for the kiddos too. I got into jar gifts because I wanted the divas to be involved in their gift giving. The fam and I and God all know my kids don’t have the money for swanky gifts…but they do have the ability to cut and glue! Healthy Snack Basket – Why should we keep our wonderful new lifestyles to ourselves???? Bottom line: Make what suits you best. But there’s still time to give a great gift from the heart!